Hello! Can you believe it's the Holiday season already? 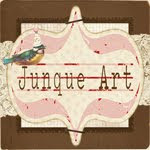 Well, the Joli Paquet girls are ready to kick off our holiday season with tutorials, inspiration, kits, and yep, a swap! We had several people request that we do another swap so we thought we would give it a go! 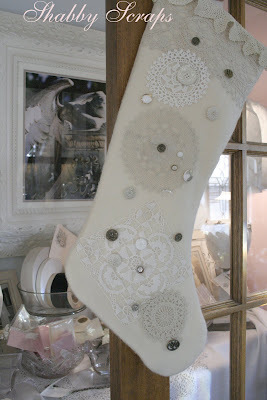 What we're swapping: We're swapping Christmas stockings with a vintage flair. 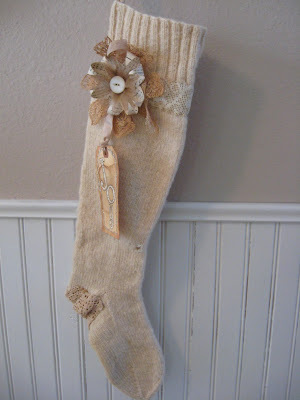 You will have ONE partner, and with that partner you will swap a stocking either made by you or embellished by you. 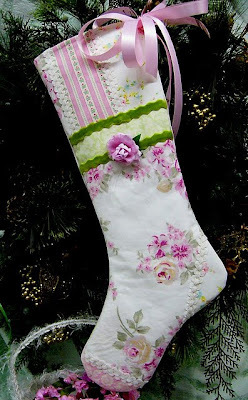 (Yes, you can purchase a pretty stocking and embellish it, but there has to be handmade touches or embellishments to it) You will also fill your stocking with happy things for your partner. 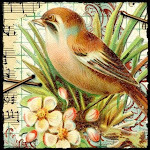 The items you fill your stocking with should be thoughtful, things you would like to receive, and with a vintage charm. 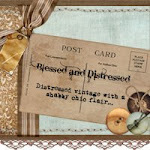 Try to include some genuine vintage items. How to join? Send me an email to cerri @ thelittlepinkstudio.com, and answer the following questions for me by Sunday the 14th. What kind of Christmas palette do you love? Please provide links to your blog, flickr, or wherever you share your work. Give us an idea of the things that you love, or don't love. Please provide your address, and email address. Please let me know whether you're willing to ship internationally or not, and be aware if you are that you will need to ship your package earlier than the deadline. Stockings will need to be mailed by December 6th so that your partner will have time to receive your stocking and enjoy it! 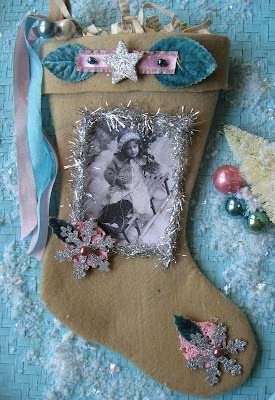 Here's some wonderful stocking inspiration I found on flickr. Don't forget to send me an email by Sunday the 14th, and I will have partners assigned by the 18th. Please feel free to add the button above to your blog if you would like, and the new holiday Joli Paquet button can be found in the sidebar to the left. Please tell your friends, and help us spread the word about our holiday season! PS, Didn't Cindy do a great job sprucing up the blog and making it feel festive? Thanks Cindy! Ohh can't wait! 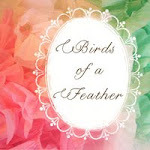 The blog is so pretty Cindy! Ohh this sounds like fun!!! 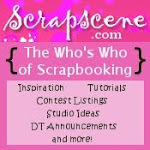 Lurve the new blog look!!! Looking forward to it!!! FUN FUN FUN! I will definitely be emailing yo and joing up for this one. Looks like great fun. Off to email. Love the new blog look. Yes, Cindy did an awesome job. Looking forward to all the tutorials. Thank you for putting this blog together for all of us to enjoy. Yes I'd love to do the stocking swap....sounds like fun! I would love to join too! Looks like fun! Yes, yes! I'd love to join the swap! I'll email you! I sent an email about signing up for the swap but I haven't heard back yet. I hope I can come play! I sent an email last Saturday signing up for the swap. I haven't heard anything back, so I'm not sure if you didn't get my email, or I missed a return email. Did you already assign partners?